rebecca likes nails: dress your nails for the occasion with ModCloth! 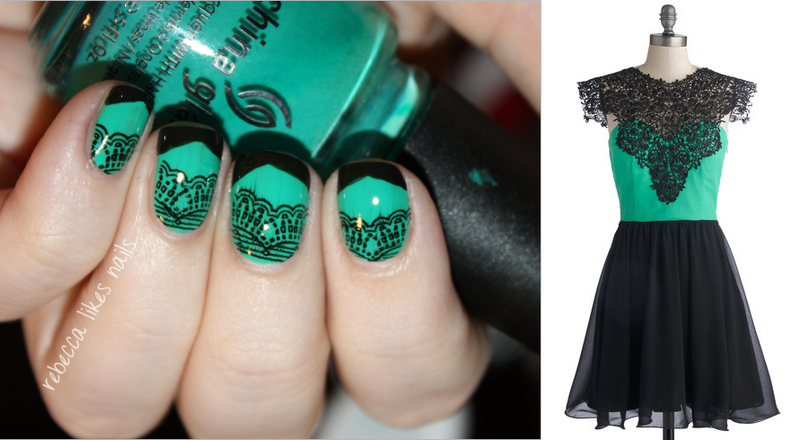 dress your nails for the occasion with ModCloth! How do you like to do your nails when you're dressing up for a party? Bold colors, sparkle fo' days, or maybe go marvelously matchy-matchy with your fabulous frock? The fine folks at ModCloth decided to round up some bloggers for a challenge to highlight ways you can perfectly pair your 10 best accessories with the dresses of the season! You may already be familiar with ModCloth's adorable Nail Klub posts on their blog. They created two matching dress'n'nails designs here and asked us to use those for inspiration, pick a dress, and go for it! Here's what I came up with. Did I nail it, or what?! I don't think the color could have possibly matched better. I used China Glaze - Four Leaf Clover and accented it with black tips and a black lace stamp from Konad plate m71. Doing the research to pick a dress was clearly a very difficult task... (Not.) The dress is the stunning Drumroll, Please dress from ModCloth. I decided I wanted something green because I wanted to choose a dress I know I would love wearing! With my red hair, I find green dresses to be really flattering. Like a mermaid, obviously. And now I totally want the dress! What do you guys think of my design? I hope you liked it! Keep an eye on the ModCloth blog because they'll be rounding up some of their favorites in a post later on. I can't wait to see what other cool nail designs people came up with when checking out all the beautiful dresses! This is pretty! Really love the base color here. Oh that's really pretty! The base color is gorgeous. I tend to match the outfit, like you did, or go for crazy glitter & bling. I love the idea of this little challenge! piCture pOlish Blog/Insta Fest 2014!